A 21-year-old male was referred after an incidental finding of a chorioretinal scar in his right fundus during a routine clinical examination. He had no ocular complaints and his clinical examination revealed a best-corrected visual acuity of 6/6 both eyes (−0.5D @ 150°right eye). Patient had no significant past medical or ocular history including infectious diseases or long-term exposure to retinotoxic drugs. Anterior segment was quiet and unremarkable. Goldman applanation tonometry was 14 mmHg both eyes. A 78D slit-lamp biomicroscopy revealed a flat globally hyperpigmented fusiform lesion with sharp margins. It was temporal to the fovea with its tip directed toward it [Figure 1]a, [Figure 1]b, [Figure 1]c. Binocular indirect ophthalmoscopy revealed no peripheral chorioretinal lesions in both eyes. Examination of the left eye was unremarkable. Optical coherence tomography revealed gross loss of outer retinal layers with thickening of the retinal pigment epithelium involving the lesion. The fundus autofluorescence images showed a globally hypopigmented torpedo like lesion with surrounding patchy hyper autofluorescent areas [Figure 2]a and [Figure 2]b. Normal fundus auto fluorescence [Figure 2]c.
Torpedo maculopathy is a rare congenital condition which mostly present as a hypopigmented oval-shaped lesion. Most of the reported cases are asymptomatic but rarely can present with scotomas. This condition was first identified by Roseman and Gass  and term torpedo maculopathy was introduced by Daily. Torpedo lesions can vary significantly in their presentation. While features like location, temporal to the fovea, horizontal oval shape, and hypopigmentation remain constant, it can even present with certain variable features like intraretinal cleft, hyperpigmentation, fundus excavation, and visual field defects. Golchet et al. demonstrated pigmentation to be variable. 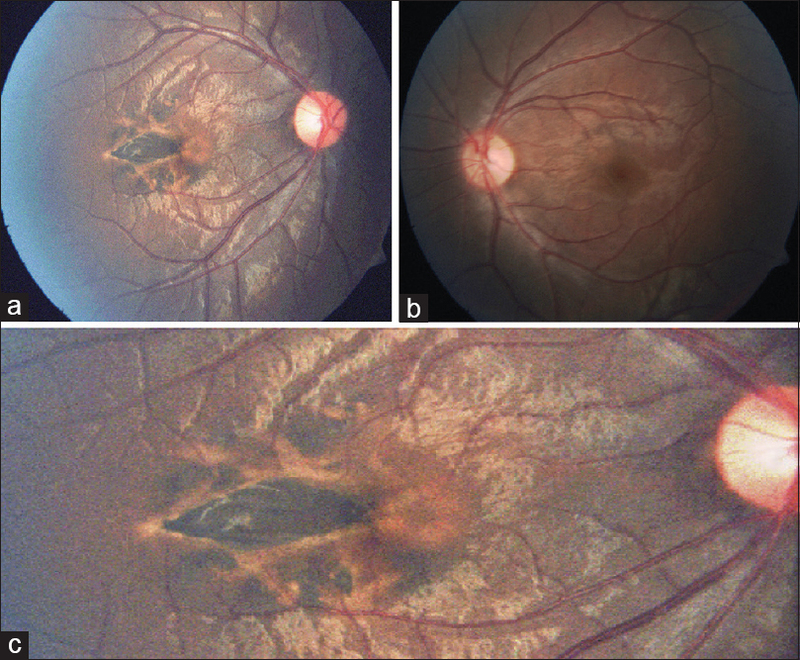 Globally, hyperpigmented torpedo maculopathy are rarely documented with a long follow up. The differential diagnosis includes congenital retinal pigment epithelial hypertrophy (CHRPE), choroidal nevus, hamartoma of the retinal pigment epithelium, trauma, and inflammatory conditions (toxoplasmosis). This unique case represents a variable presentation of torpedo maculopathy and multimodal imaging supports the findings. Pian D, Ferrucci S, Anderson SF, Wu C. Paramacularcoloboma. Optom Vis Sci 2003;80:556-63. Roseman RL, Gass JD. Solitary hypopigmented nevus of the retinal pigment epithelium in the macula. Arch Ophthalmol 1992;110:1358-9. Daily MJ. Torpedo maculopathy or paramacular spot syndrome. In: New Dimensions in Retina. Chicago; 10-13 November, 1993. Shields JA, Shields CL, editors. Tumours and related lesions of the pigment epithelium. In: Intraocular Tumours: An Atlas and Textbook. 2nd ed. Philadelphia, PA: Lippincott Williams and Wilkins; 2008. p. 431-80. Golchet PR, Jampol LM, Mathura JR, Daily MJ. Torpedo maculopathy. Br J Ophthalmol 2010;94:302-6. 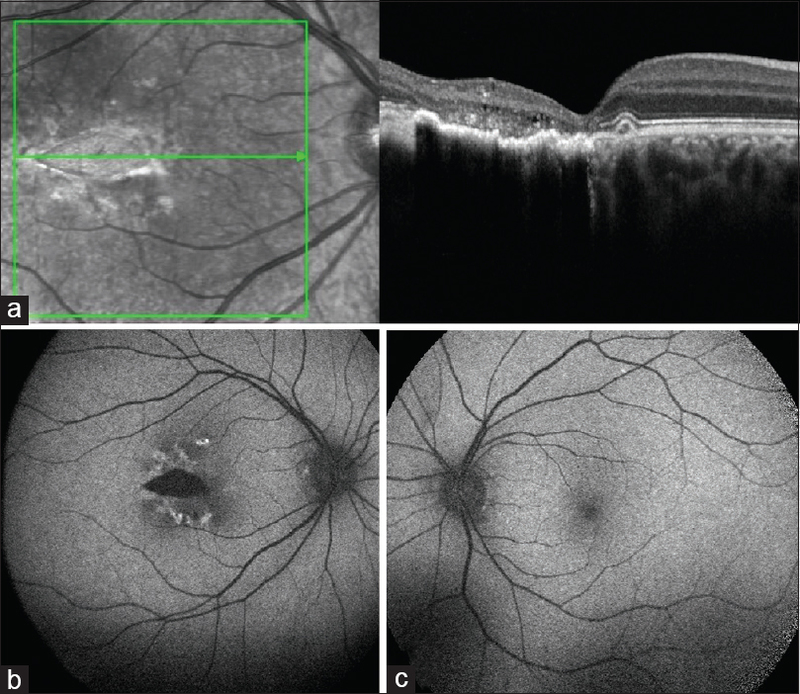 Rohl A, Vance S. Hyperpigmented torpedo maculopathy with pseudo-lacuna: A 5-year follow-up. Case Rep Ophthalmol 2016;7:184-90.